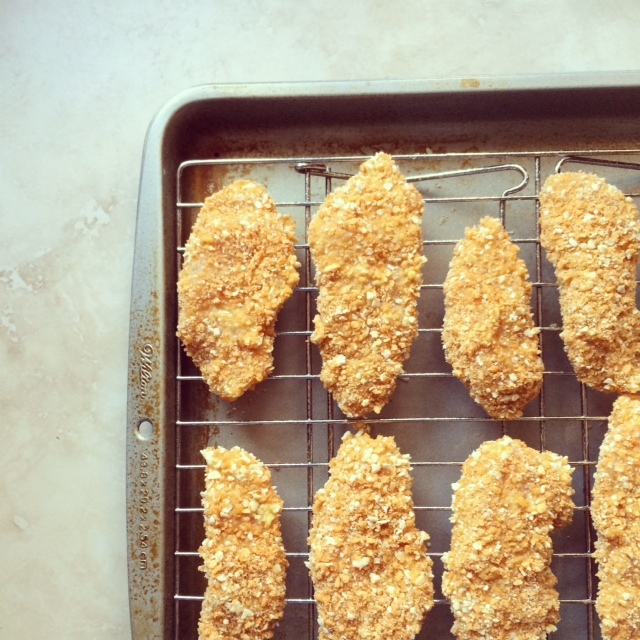 there are a few basic recipes that i am constantly looking to better or to perfect and chicken tenders have long been one. lately i have been making them more often, since we have a preschooler and a toddler running our lives these days and they are a great go-to for easy & healthy meals. i much prefer making them myself when i can, instead of the freezer chicken tenders & nuggets that truthfully scare me a little. every chicken tender i have made in the past has been just ok, “neither here nor there”. i’ve made some with breadcrumbs and some with panko. i’ve tried lots of different ways to bread them – with buttermilk, with whole milk, or with eggs, breaded once or twice… but i still had not found my favorite tenders that were perfectly crunchy, yet moist, and held their breading all over without falling off during baking. and i still had the problem of the breading getting mushy on the underside. well, after many tests & tastings & tweakings i can safely say i am forever free from chicken tender mediocrity! i have finally mastered the elusive perfect homemade chicken tender. as for the dipping sauce: i have 2 all-time favorite aioli recipes in my arsenal – the recipe below is my super quick and easy version that uses ingredients i always have on hand. aioli is my favorite dipping sauce for chicken tenders and complements these really well. if you can stand to turn down the ketchup, i promise, it’s worth it. 1. preheat oven to 475. position rack in lower third of oven. 2. place an all-metal drying rack on a large cookie sheet. spray or brush drying rack with olive oil. 3. in a food processor or blender, grind cheddar and saltine crackers until finely ground then place in a wide & shallow bowl. in another bowl, whisk the eggs and dijon mustard. then place the flour in a third wide & shallow bowl. 4. with each chicken tender, dip it first into the flour, shaking off excess. then dip into egg/dijon mixture and then into the cracker mixture, pressing crumbs onto the tender making sure it’s evenly coated. repeat with remaining tenders. place the tenders an inch or two apart on the metal rack on the cookie sheet (see picture above). 5. bake for 14-16 minutes, until they are beginning to golden. serve warm with aioli dipping sauce. mix all ingredients together with a whisk until completely incorporated. during the winter, there is a lot of chili-and-cornbread-eating, curl-up-with-a-hot-bowl-of-soup nights around here. i love the warmth and the fullness of my belly after a big bowl. but after a few months of this loveliness, i do crave a fresh, crisp, even crunchy dinner. 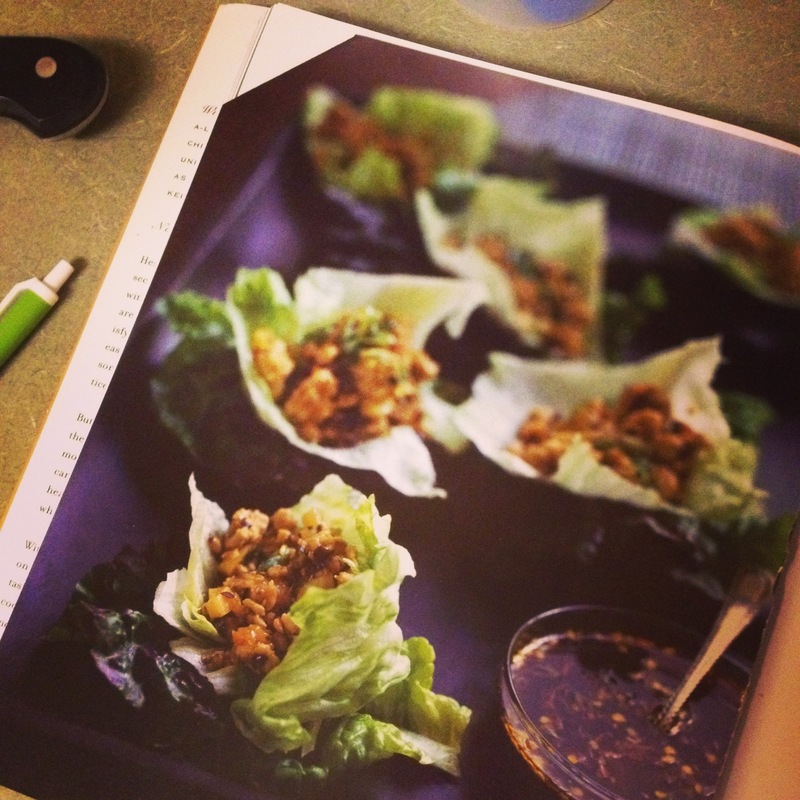 and recently, it was these chicken lettuce cups. if you’re like me, you first fell in love with this concept after discovering the chicken lettuce cup at p.f. chang’s. i’ve always loved their version of the dish, but this recipe is by leaps and bounds the best i have ever made myself and the best i have ever eaten. i might even like them better than p.f. chang’s. *to make this recipe whole30 friendly: for the dipping sauce, sub coconut aminos for the soy sauce, sub pure date syrup for the brown sugar, omit the cornstarch, and make sure there is no added sugar in your OJ. 1. for the sauce, mix all sauce ingredients together with a whisk and set aside. 2. heat a large nonstick skillet over medium-high heat. when the pan is hot, add the peanut & sesame oils. saute the carrots, green onions, ginger, and garlic for 4-5 minutes until the vegetables have softened. add chicken and cook, stirring constantly to break up the meat. 3. when the chicken is almost cooked, add the sauce. bring to a boil, then reduce heat to simmer and continue cooking 5 or 6 minutes. 4. remove pan from heat, stir in water chestnuts. spoon the mixture into lettuce cups and serve while warm. this is my favorite, all-time, go-to recipe for chicken parmesan (courtesy martha stewart magazine, years ago, and as usual edited by yours truly just a bit). it is light and crunchy, thanks to the panko breading (my edit, sorry martha) and has so much delicious, italian flavor. it’s probably the red wine vinegar… i’ll eat almost anything if it has red wine vinegar in it. or on it. it is perfectly paired with a simply dressed pasta or – as recommended by martha herself – arugula, tomatoes, blanched green beans, and crumbled parmesan cheese topped with olive oil & vinegar. 2. in a small bowl, whisk together oil, vinegar, salt, red pepper flakes, oregano, and garlic. pour into a large ziploc bag. add chicken to bag, seal, and let marinate in fridge for at least 1 hour or up to 8 hours. 2. in a medium , shallow bowl stir together panko, cheeses, parsley, and pepper with a fork. line a rimmed baking sheet with foil. oil lining (i highly recommend a spray olive oil – much easier & cleaner). 3. dredge each chicken piece in panko mixture to coat; shake off excess. transfer to prepared baking sheet. 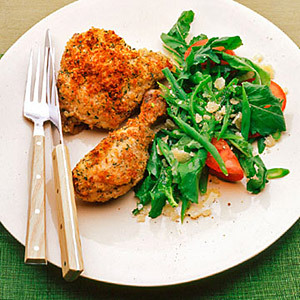 4. bake chicken until cooked through, 45-50 minutes. using a spatula, loosen chicken from sheet to serve. this recipe is adapted from the ever-brilliant barefoot contessa. she’s got such a knack for easy, flavorful dishes. 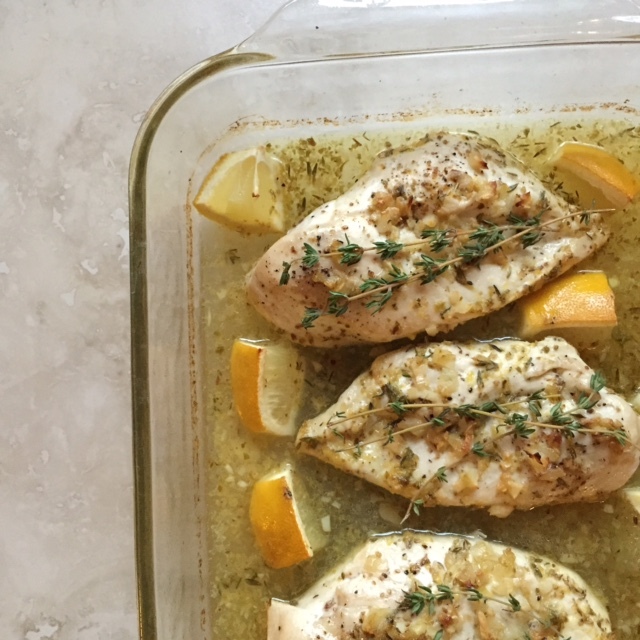 i have gently edited this recipe for i how i tend to cook… using a little less olive oil and making sure all of the lemons got used and not wasted. and giving an option for those of you who would rather cook with chicken stock instead of wine. it has a bright, delicious taste and is pretty easy to make, perfect for a weeknight meal. and it’s one that i know everyone is sure to like. 2. warm the olive oil in a small saucepan over medium heat. add the garlic and cook for about 1 minute – don’t allow garlic to brown. remove from heat and add the white wine (or stock), lemon zest, fresh-squeezed lemon juice, oregano, thyme, and 1/2 tsp salt. whisk and set aside. 3. pat the chicken breasts dry and brush both sides with olive oil and sprinkle with salt & pepper. place them in a 9×13 baking dish that has been lightly coated on the bottom with olive oil or cooking spray. 4. pour sauce over the chicken breasts in the baking dish. 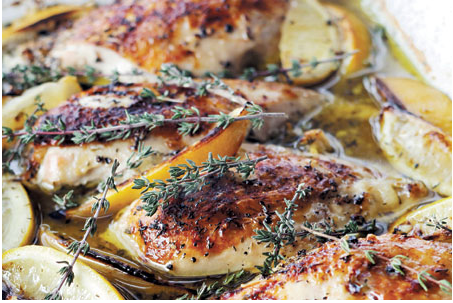 cut the third lemon into 8-10 wedges and nestle among & between chicken breasts. 5. bake for 35-40 minutes, depending on the size of the chicken breasts, until the chicken is done and the skin is slightly browned. remove pan from the oven. cover dish tightly with foil and allow to rest for 10 minutes. serve hot with pan juices and lemon garlic spaghetti. 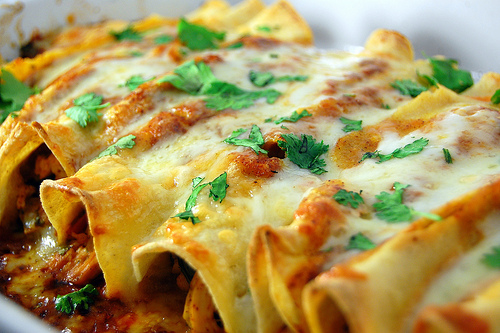 where would we be in life without enchiladas!? i would be in a sad, dark place for sure. now usually you’ll find chicken enchiladas with a verde or tomatillo sauce, which is what i always order at any mexican restaurant. but these are such a lovely departure from the standard. and oh so yummy. this recipe is a result of two or three different recipes (see bottom for sources) that i used to make it my own. i tweaked it until it was perfect. it is probably the best enchilada plate i have had, maybe ever, and i highly recommend you make it. right now. 1. preheat oven to 400. shred cheeses and toss together in a bowl – set aside. grease a 9×13 baking dish. 2. put oil in a large saucepan on medium/medium-low heat. add in onion, jalapeño, and 1/2 tsp salt. stirring often, cook until the onions & jalapenos have softened, about 5-8 minutes. add garlic and cook about 30-60 seconds, to soften. add chili powder, cumin, and sugar and cook another 30 seconds or so. stir in the tomato sauce, water, rotel, and green chiles. bring to a simmer, and cook until slightly thickened, about 5 minutes. (*if you are using rotisserie chicken, let the sauce cook another 10-15 minutes or so, then move on to #3.) nestle the chicken into the sauce. reduce heat to low, cover & cook 10-12 minutes. flip chicken breasts over, and continue to cook 10-12 minutes more. transfer chicken to a plate and set aside to cool. 3. strain the sauce mixture through a strainer into a medium bowl, pressing onion mixture to extract as much liquid as possible. transfer the onions to a large bowl and set aside. add 4 oz. sour cream to the sauce and whisk until lumps have disappeared. 4. with two forks, shred the cooked chicken breasts. add cooked chicken to the onion mixture, and add 1/3 cup of the enchilada sauce, 1 cup of cheese, and the cilantro. toss to combine. wrap tortillas in a paper towel and soften in the microwave for about 45 seconds. 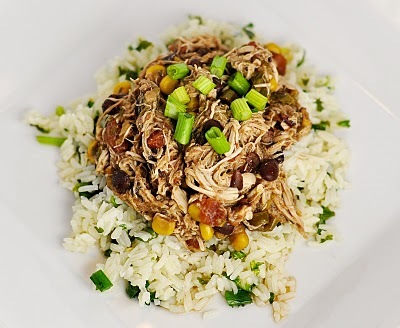 on a clean surface or large plate, spoon 1/4 cup of the chicken mixture evenly down the center of each tortilla. tightly roll each enchilada and lay seam-side down in the baking dish. pour sauce evenly on top and then cover with remaining cheese. 5. cover the dish with foil and bake for 20-25 minutes. remove foil and cook another 5-7 minutes, until the cheese has browned. remove from the oven and let stand about 10 minutes before digging in. 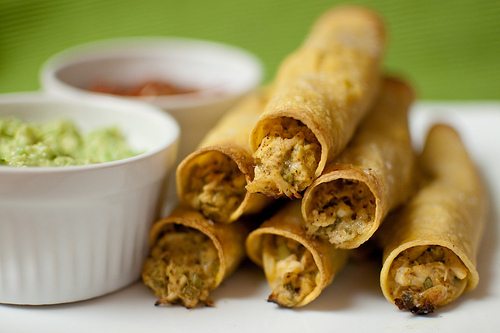 top each serving with freshly chopped cilantro.